Not since man landed on the moon have interest rates been this low…..and they’re going lower this year! Last week the interest rate on Australian bonds dropped below 2 percent for the first time since 1969. This is positive for home owners as bonds are a lead indicator for mortgage interest rates. The fall in bond yields is based on the immediate fear of the UK leaving the EU, affectionately referred to as BREXIT. But there is a deeper theme underlying the drop in bond rates – the fear of deflation based on evidence of slower growth or possibly another world recession. In the near term this is good news for mortgagees who should see a further drop in interest rates at the next RBA meeting. Hopefully the banks will pass on most of the rate drop when it happens. It’s not just an Australian theme. Interest rates are low and falling everywhere. In fact they have turned negative in some parts of the world. 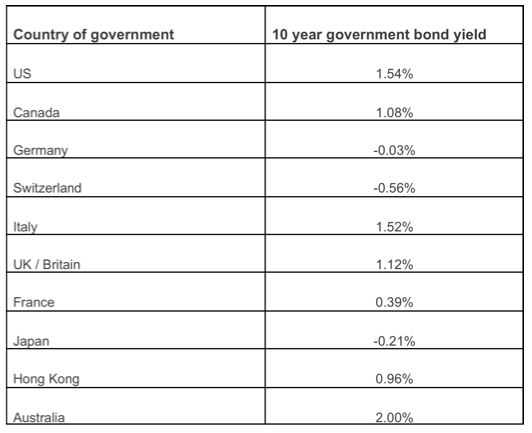 Specifically, the governments of Japan, Switzerland and more recently Germany can now borrow funds and receive a fee for doing this ie their 10 year government bonds are negative (see table below). Normally people have to pay interest when they borrow funds because the value of money in the future is expected to be less than today. Why? Because the forces of inflation tend to erode the future value of money. However, if expectation shifts from inflation to deflation then people should expect the value of their money to be higher in the future. So what bond markets are telling us is that we should expect deflation in some major countries around the world. Britain’s main concern and reason for BREXIT is the enormous flow of people coming across their boarders from Europe. Withdrawing from the EU is one way to stop unwanted immigration. Britain could simply redraft their immigration laws to achieve the same effect. What is interesting is that these policy options are seen as protectionist and contrary to the doctrine of free trade or globalisation. The world has not seen protectionism in the developed world since the great depression of the 1930s. These are interesting times we live in. It is now estimated that some $US10 trillion is now parked in bonds with governments that have a negative interest rate. Reuters this week reported that Europe’s top insurers are selling protection to German banks that hoard billions of euros of cash in vaults to avoid paying penalty interest rates by parking funds with the ECB. What is clear is that there is a good deal of fear in the world at the moment as a result of the forces of slow economic growth, deflationary trends and massive geopolitically driven immigration. What is also pretty clear is that interest rates will go lower from here. This would be positive in the near term for mortgagees. *DISCLAIMER: This post is not intended to be taken as financial advice of any kind. Please consult a licensed financial advisor or accountant for advice.